OWN A DUCA'S NEAPOLITAN PIZZA FRANCHISE! Duca’s Neapolitan Pizza Franchise may be the best pizza franchise for you. We offer the best-tasting pizza in the country, cooked in an 800-degree custom Neapolitan Brick Oven and fired to perfection in just 90 seconds. We are currently accepting new pizza franchise applicants in all 50 states. Some territories may be taken. Applying for a Duca’s Neapolitan Pizza franchise is completely free. Find out if this fast dining pizza franchise opportunity is the right pizza franchise opportunity for you! Q: What is the "Duca Difference"? A: The Duca’s Neapolitan Pizza Restaurants create authentic Neapolitan wood-fired pizzas made from scratch with recipes that were first created in the 18th century — Fresh low-gluten dough (made from scratch each morning), fresh mozzarella cheese, handpicked basil, ripe sweet tomatoes grown in volcanic soil, rich Italian olive oil, and baked in an original Stefano Ferrara Neapolitan handmade brick wood-fired oven to a blistering 800 degrees….cooking in 90 seconds! Duca’s has the reputation of “old world neighborhood gathering place”, where people get together as friends to relax, enjoy the intimate atmosphere, savor the authentic food, and partake in a traditional Neapolitan family tradition, where you feel “Papa Duca” would greet you personally with a smile. Fresh – Fast – Friendly! Q: How do I know that investing in a Franchise is right for me? A: That is what we will help you figure out. The initial franchise application (below), and subsequent interviews will help us both determine if we are a good fit. Having a franchise means you’re getting on the bandwagon of an idea that’s already proven successful. Of course, as with any business, there are still challenges involved in starting a franchise and running one. As much thought will have to go into a location, hiring, and management as any other type of business, even with the business model and brand laid out for you. The first step in choosing the franchise you wish to invest in is finding one that is solid and proven, as with Duca’s Neapolitan Pizza. The steps that follow will determine if we are a good fit. Franchise establishments are expected to grow an additional 1.9 percent in 2018 to 759,000. Franchise employment is projected to grow 3.7 percent, continuing to outpace the rest of the economy. The gross domestic product (GDP) of the franchise sector is forecast to exceed U.S. GDP growth and increase by 6.1 percent to $451 billion. The franchise sector will contribute approximately 3 percent of U.S. GDP in nominal dollars. Franchise business output is expected to increase by 6.2 percent to $757 billion. Franchise Personal Services experienced strong growth over the past year and is expected to rank first in growth of the number of establishments and in employment in 2018. Q: Do you have a team to help us open a Duca’s Franchise? A: You’ll also have the very best, step-by-step professional support in every way from our headquarters, franchise coordinators, realtors, hands-on culinary experts, and a superior, informed marketing team. No worries. We have all the answers to your questions. Feel free to call any owners of our restaurants in Colorado to get a taste of real life in the Duca Pizza business. No schmooze, just facts. We are committed to your success. We will provide you with an all-hands-on-deck approach to ensure swift and aggressive action, in partnership with the sharpest local real estate expertise to ensure efficient site selection, negotiations, and lease execution. The Duca Team will be working closely with them throughout the entire franchise process. Q: What are the startup and franchise fees? A: Duca’s is looking for strong business people with an acuity for franchising, and the financial strength and vision to hold the high standards required by a Duca’s franchise. That being said, Duca’s mindset is to “water the seed to help it grow.” We provide you with every opportunity to have as minimal as possible financial barriers to entry to ensure that you can grow and prosper. We are committed to you in every way. Many variables figure into the costs, such as location and your personal/business financial situation. Our professional financial advisors will help work out the perfect investment plan for you. We will provide you an estimate at that time but will need from you your own personal and business financial statements to make sure it’s a “good fit.” You will, of course, need available capital or the ability to obtain a loan for the franchise process. Q: How long does it take to open a Duca Franchise? Each situation will be different, but we estimate between 6-8 months after the site selection is complete. The Duca team will be working with you very closely on the timing of the site selection, negotiations, and lease execution, as well as franchise coordination, culinary training, and marketing. 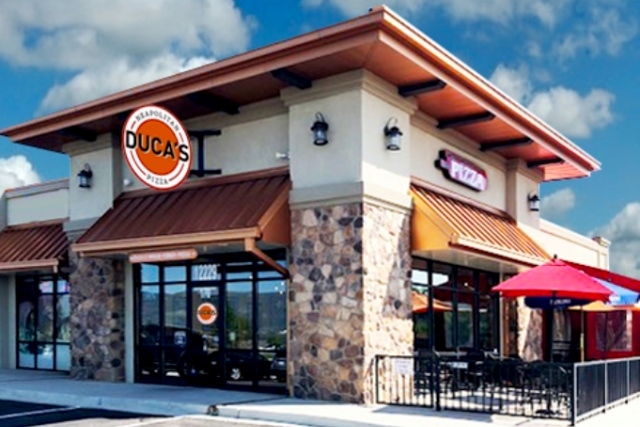 Duca’s provides their franchisees with on the ground space layout consulting with a build out item punch list and its approximate shipping time. Duca’s real estate support provides all the support you need to ensure swift action with local commercial real estate expertise to have efficient site selection, negotiations, and lease execution. Q: Can I open a Duca Franchise anywhere? The answer is yes, but we currently are emphasizing efforts in the Southwest. However, if you are personally interested in a franchise in another part of the country, let us know why you think that particular location and local market would make a good fit. We are open to exploring. By the way, we have found that Duca tends to thrive in neighborhood retail centers. The following information is the preliminary step in the Duca’s Pizza franchise application. The submission of the application does not obligate you or Duca’s Neapolitan Pizza. All information MUST be completed in full before submission. APPLY TODAY AND BECOME A DUCA’S NEAPOLITAN FRANCHISE PARTNER!